Travel the World in Books Readathon–Wrap-up of Activities and Gratitude! After two weeks of participating in the first Travel the World in Books Readathon, I am most happy for having spent time with this wonderful community of bloggers. Big thanks to our hosts–Moms Small Victories, Lost in Books, and Savvy Working Gal–and to the authors who posted about their books and bloggers who offered tutorials, mini-challenges, and a steady stream of great book recommendations! I finished Daughter of Fire: A Portrait of Iceland by Katharine Scherman and posted about it as my first book review here on Northern Lights Reading Project. I finished posting the Project Reading Lists by subject here at Northern Lights (see drop-down menu on its tab above). I separated them into categories of Literature, History, Biography, Travel, and Food (cookbooks!). Feel free to comment with more ideas of books that I should be adding. I began my Google map of the Fictional 100 characters from my book, with the help of Guiltless Reader’s fabulous tutorials. I had wanted to finish my map by this week, but it has taken me longer to do, because each fictional character has many possible images (illustrations, various books), and I want to include a nice one with each pinned location. I will be posting the finished map over at The Fictional 100. I am well into The Laughing Policeman, a Swedish detective classic by the writing team of Maj Sjöwall and Per Wahlöö. It’s great! A real puzzler and so well written. I especially like reading details about the different neighborhoods in Stockholm, where it is set. I’m sure I will want to read the rest of their Martin Beck series, after this compelling introduction to it. I’m also enjoying The Fairy Tale of My Life by Hans Christian Andersen. I was delighted with the responses of people who commented that they wished to read Andersen’s autobiography too–I will concentrate on it next! Those who love his fairy tales will recognize the same voice, with its warmth and human insight, as he discusses the hardships and joys of his early life and his progress as a writer. I set up a Facebook page for Northern Lights Reading Project. I will be sharing my reviews and other news about books from Iceland and Scandinavia there. This was not on my original to-do list, but it will help me as I continue the Travel the World in Books Challenge in the future. I participated in Facebook and Twitter chats, and did the book scavenger hunt–it was fun to pull out–and dust off–some favorite books, and share their covers. I enjoyed Tanya’s daily update posts with author interviews and great book ideas. I also appreciated Becca’s Take Me Away recommendations for different continents and countries. ReaderBuzz and others offered lists of books by country for children. Finally, I think that Tanya at Mom’s Small Victories will have to change her blog name to Mom’s Big Victories after conducting such a successful and big-hearted readathon! It is warmly appreciated! This entry was posted in Biography, Literature, Travel and tagged Readathons, Travel the World in Books. Bookmark the permalink. 9 Responses to Travel the World in Books Readathon–Wrap-up of Activities and Gratitude! Thanks so much Lucy for your kind words and so glad to have met you through this event. I have been wanting to do something like this for awhile so to see everyone’s excitement and support is both overwhelming and humbling. Glad to hear you will join our reading challenge and hope you join us for future events! You have a gift for it! I will certainly look forward to future events. Thanks, Tanya! I am looking forward to your Anderson report–hoping it inspires me to read the book as well as revisit his stories. Now I’ve got to go take a look at your map. I love stuff like this! I agree Tanya did an amazing job with this readathon as did Becca. It was a great event. Next year I hope to participate more. Glad you enjoyed it and thanks for all your hard work. Very happy to meet you and to see your beautiful blog, combining career and literary concerns with deftly chosen books. Thanks so much for being a host in this event! Two of the best books I’ve ever read came from this part of the world. One is Dreamers and the other is Independent People. Happy you had a great readathon! 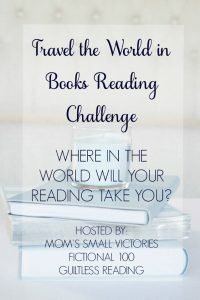 Here’s my Travel the World in Books post! Thanks, Deb! You read so many books! Brava! You certainly made the most of the readathon and I love your blog design and the way you tracked your activities. I have started Independent People, which is fascinating and a modern Icelandic classic. I remember reading Brad Leithauser’s review (which is now a forward in the paperback reissue) when it first came out in the New York Review of Books in 1995–it stuck with me, and after almost 20 years, I’m finally getting down to reading it! Who is the author of Dreamers? I’d like to know about it, especially if it ranks high among your favorites. Glad you are reading IP. Hope you find it as brilliant as I did. The author of Dreamers is Knut Hamsun. Love to hear what you think,about these.